The Holy Spirit. There is “something wonderfully mysterious” about him, says pastor and theologian Sinclair Ferguson. He is the third person of the Trinity, the “self-effacing” member. He works ever in tandem with God’s word — incarnate, spoken, and written. He is one of the Christian’s greatest sources of comfort. And too often he is one of the church’s greatest sources of controversy. But before getting bogged down in dispute related to his miraculous gifts and mysterious works in the church today, take a step back and see who he is, and who he has been, beyond the firestorms about prophecy, tongues, and healing. Not only has he been the Son’s eternal partner in the uncreated fellowship of the Trinity, but the Spirit was there with the Father and Son at creation (Genesis 1:2). He was there overshadowing Jesus’s conception (Luke 1:35), and there at his baptism (Luke 3:22) and temptation (Luke 4:1–2). Jesus performed his miracles through the power of the Spirit (Luke 4:14–19). When Jesus’s closest earthly companions betrayed him, denied him, and scattered, the Spirit walked with him all the way into the jaws of death, empowering him to offer himself freely (Hebrews 9:14). And the Spirit was there on Easter Sunday to raise him in power (Romans 1:4). Indeed, what a companion he is. Should We Give Attention to the Spirit? When asked about the Holy Spirit, Ferguson says his mind first goes to Jesus’s “Farewell Discourse” in the Gospel of John, chapters 14–17. As Calvin says, if the other Gospels show us Jesus’s body, it is John’s Gospel that shows us his soul. Here we learn about the Spirit’s “self-effacing” nature, as Jesus says the Spirit “will bear witness about me” (John 15:26) and “will glorify me” (John 16:14). But there is more to say that just this. Even as riddled as we are about so many questions concerning the Spirit, God has not left us without significant revelation about his person and work. When the seeming crazies come out of the woodwork, fascinated with all things bizarre in the name of the Holy Spirit, Ferguson counsels that we take them to Jesus’s own words about the Spirit. “The Lord’s sheep hear the Lord’s voice,” he reminds us. Look at Jesus’s words together. Most Christians have the least hang-ups about Jesus. Let him speak to us about his closest companion. And one important item to draw attention to is that the Spirit’s work accompanies the Word incarnate and the work spoken. To access this 12-minute episode, click below. 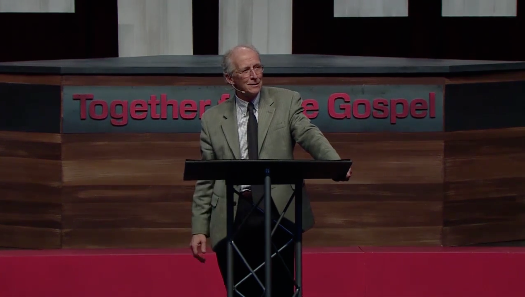 My heart was already full as John Piper began his message that would close the recent Together for the Gospel conference. I prayed that God would use his message to implant a passion within our hearts that would shape our lives and ministries for the length of our days. I was very moved by John’s faithful, careful, and precise exposition of Romans 9. Are we driven by the same agony when we see the lost around us? I was honestly unprepared for where John would take us at the conclusion of his message. Time and space seemed to collapse for me as I remembered being in the same kind of meeting, hearing the same gospel pleading, many, many times as a boy. I remember one time in particular, when as a nine-year-old boy I heard a part-time preacher who was a full-time phosphate miner preach the gospel and then plead with us to come to Christ. And I did. I know there was more to my salvation than was evident in that moment. I know that my salvation is secured in the eternal plan of a sovereign God. I know that I was effectually called by the Holy Spirit. I had the blessing of Christian parents and constant Christian witness. But I also know that the Holy Spirit used a simple preacher who was willing to plead with sinners, and thus I came to Christ. When John began to sing, “Softly and Tenderly, Jesus Is Calling,” and to sweetly call a generation of young Reformed Christians to sing it with fervor and broken-hearted pleading, my heart broke. I tasted again the sweetness of my own conversion, and I felt more at home than words can describe. But I was also broken-hearted with a sense of loss that so many of the 8,000 young people in that great room had never seen an evangelist plead, a godly father present the gospel, a sinner called by the Holy Spirit flee to refuge in Christ. I was overcome with joy and profound thankfulness for what happened in that room that Thursday afternoon. We all got to see an evangelist pleading with sinners, pointing to Christ, unashamed to plead with emotion and passion and agonized urgency. I heard the conviction in the voices of a rising generation as we sang that hymn, and my spirit rose within me. I was thrilled to lose my composure for the sake of a moment of such joy. “Softly and tenderly” still rings in my ears, and John Piper’s anointed exposition still rings in my heart. I am thankful beyond words to know that others will hear this message. Don’t dare miss it. Albert Mohler serves as president of The Southern Baptist Theological Seminary in Louisville, KY.